The Pro is integrated with a custom DLP projector which decreases curing times using high-intensity light. As such, a new Dynamic Light Control function is used to adjust light intensity for each 3D printed layer, improving accuracy and efficiency. Also contributing to part accuracy, is a self-monitoring, heated tank which is designed to maintain liquid resin at the correct temperature. The Pro95 has a print volume of 190 x 100 x 200 mm, facilitating the packing of multiple dental appliance designs such as surgical guides, night guards, and up to 21 dental arches in a single build. SprintRay Software, which recently added 3Shape’s Implant Studio, and its automated capabilities have been updated for the Pro. New features of the software create the ability to convert intraoral scans into 3D printable files. The custom DLP projector for the Desktop Pro created in collaboration with Texas Instruments, a manufacturer of semiconductors and integrated circuits. Image via SprintRay. SprintRay has also introduced its proprietary Selectively Textured Elastomeric Membrane (STEM) Tank technology in the Pro95. The STEM Tank creates air between the resin and tank floor to minimize adhesion. Elastic displacement is then used to separate the print from the tank floor. As a result, a 3D printed part is produced with greater speed while decreasing the risk of failure. Moreover, a magnetic lock on the build platform is featured to ensure a perfect build plate orientation. For safety, a second magnet senses when the lid is open, reducing the risk of exposing resin to ambient light. An exploded view of the STEM tank. Image via SprintRay. 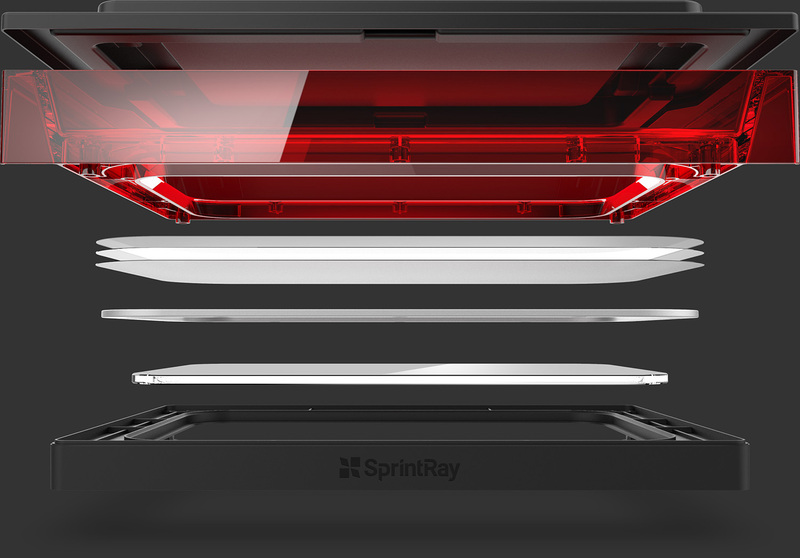 The SprintRay Pro95 dental 3D printer is available for preorder at $6,750. It is currently on display for the first time at the Chicago Dental Society 2019 Midwinter Meeting. Don’t forget to nominate SprintRay and others for the upcoming 2019 3D Printing Industry Awards. Featured image show the SprintRay Pro Desktop Dental 3D Printer and Pro Cure Post Processing machine. Photo via SprintRay.